As the largest metropolis in the American Southeast, Atlanta, Georgia eclipses Charlotte, Richmond, and Miami in both population and wealth. The city’s great size and prosperity is a function of its diverse economy, which brings together automotive manufacturing, technological development, telecommunications, and a myriad of other advanced industries. ExpeditedFreight.com brings essential supplies to each of these industries while delivering their finished products to customers. In this way, we fuel the growth of one of America’s most vibrant cities. 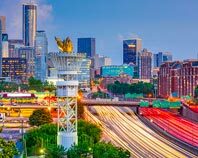 Atlanta’s economy is as complex as it is large, and keeping growth going is an endless challenge for local businesses and government officials. Take the city’s manufacturing industry. Kia’s West Point plant, located in one of Atlanta’s suburbs, made headlines back in 2016 when it produced its 2 millionth vehicle after less than a decade in operation. Yet producing so many vehicles requires regular shipments of parts, tools, and other supplies, which is no easy task given the demands on local roads. 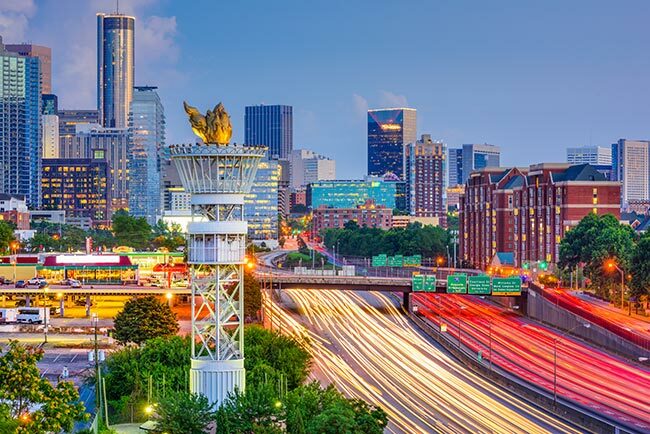 Not only do Kia and other manufacturers have to compete with shipments for Atlanta’s telecommunications and retail businesses, but they must share the roads with the nearly 6 million people living in the surrounding metropolitan area. Given tight production schedules and the need to maximize safety, carriers have an extraordinarily difficult time delivering for these companies. For all the difficulties faced by traditional carriers, ExpeditedFreight.com has the resources and expertise to ship into and out of Atlanta with ease. Metropolitan Operations - Expedited Freight does not limit itself to shipping into and out of Atlanta proper. Our express freight team also operates in nearby communities, such as Alpharetta, Marietta, Columbus, Macon, Chattanooga, and Athens. Dedicated Trucking - Unlike most carriers, ExpeditedFreight.com doesn’t make you share space with other customers. Instead, we reserve a truck or van for your order alone, tailoring the size of the vehicle to that of your payload. This speeds up the delivery process while facilitating the use of specialized preservation and storage equipment. Route Planning & Tracking - At the beginning of each delivery, we plan the route from start to finish in detail, finding the fastest path to your destination given weather, traffic, and all other contingencies. We then track the truck assigned to you while it is en route, looking out for sources of delay. Whenever we detect a likely delay, we will guide your truck around it, keeping your order on schedule. Safety Steps - ExpeditedFreight.com makes safety our main goal on all deliveries. We require a team of two drivers to operate each truck that is making a distant delivery, ensuring that both will have a chance to rest and neither will be too tired to drive. We also secure your goods for the entire ride, make sure to travel the speed limit, and avoid hazardous routes or terrains. ExpeditedFreight.com is committed to delivering all your items on time and intact. For more information, contact us today at (678) 288-5005. Copyright © 2019 ExpeditedFreight.com All Rights Reserved.